Wassef Haroun was born in Syria and raised in Lebanon before moving to the United States for school. Haroun settled in Seattle with his wife, Racha, in 1989 to start a career in technology and computer science. 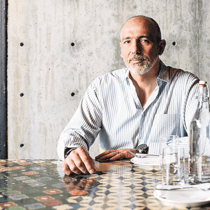 Haroun retired from the tech world, and in 2012, he and Racha opened Mamnoon Restaurant (Arabic and Farsi for “thankfulness”) as an experiment to bring the food and traditions of the Levant to an American audience. More than just a restaurant, Mamnoon became a bridge for two cultures where compassion, curiosity, tolerance, and progressive values paved the way for harmonious interactions. Haroun expanded upon Mamnoon, and opened Anar, serving high-quality foods; Mamnoon Street, offering Middle Eastern street foods; and Mbar, a rooftop restaurant and bar serving the best of Seattle in a contemporary menu inspired by Mediterranean flavors. Together these locations form Mama Restaurant Group, a convergence of food, drink, art, and community that offers a rich celebration of culture and flavors in the Pacific Northwest.